Peter Arkell reviews a new book explaining how the state used the non-existent 'ricin plot' to bolster the case for war and how Blair shared this useful fiction with the US. The ‘ricin plot’ of 2002 is a case study of the way in which the forces of the state bend events to their advantage, regardless of the truth or the impact on the lives of the people caught up in them. Following a series of police raids in London in late 2002, five men originally from Algeria, were accused of a terrorist plot, involving homemade explosives and the deadly toxin ricin. The media, tipped off in advance, swung into action with sensationalist reports claiming anti-terror police had disrupted an Al-Qaeda cell ready to unleash deadly poisons on the population. Prime Minister Tony Blair claimed the arrests “show this danger is present and real and with us now. Its potential is huge”. And soon after in February 2003, US Secretary of State Colin Powell, while trying to persuade the UN Security Council to support a war against Iraq, cited the supposed discovery of ricin as evidence of a “sinister nexus” between Iraq and Al-Qaeda. But in reality there was no ricin and no Al-Qaeda cell either. Four of the men were found not guilty of all charges at their long trial in 2005, while the fifth, Kamel Bourgass, was found guilty of a lesser charge of conspiracy to cause a public nuisance by using explosives or poisons to spread fear or disruption. 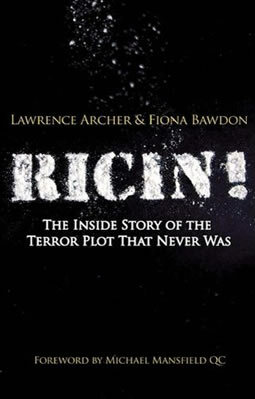 The story of how the police, the press and the politicians cooked up this conspiracy, is well told in a new book Ricin! The Inside Story of the Terror Plot that Never Was. It is also the story of a small group of jurors who, very unusually, took a stand after the trial, when their verdicts were effectively disregarded with the re-arrest of several of the acquitted men. Significantly, the book is written by the foreman of that jury, Lawrence Archer, a telephone engineer, and journalist Fiona Bawdon. Many Algerians found their way to the UK after fleeing their home country in the 1990s. Civil war and an army coup had followed the cancellation of an election when the Front for Islamic Salvation looked likely to win. The Algerian secret police (the DRS) picked up young people at random for questioning, often under torture. Many thousands of people simply disappeared. Most of those who fled to Britain arrived penniless, as illegal immigrants. With the tabloid press barking at politicians to be ever harder on “bogus asylum seekers”, there was little chance of getting into the UK legally. Many of them gravitated to the Finsbury Park area in North London, to settle in a community where problems were shared and help given to new arrivals. The book lifts the lid on the conditions of life and survival for people in this community, and how things got even harder after the attacks on America on 11 Sept 2001. The Blair government passed new anti-terrorist laws under which the holding of false passports would take on a far more sinister construction than before. The police raid on the flat in Wood Green where two of the accused, Sidali Feddag and Kamel Bourgass lived, turned up some recipes for making various poisons and explosive devices and some raw materials (apple pips, cherry stones, a few castor beans and a nicotine sludge among others), out of which poisons could be made – and just over £4,000 in cash. Bourgass claimed in court that the recipes and the money belonged to a former associate Mohammed Meguerba, who wanted to give them to villagers in Algeria to fight back against government militias who would seize their food, money and goods, killing anyone who resisted. An entirely innocent explanation for the seeds was put forward too; they were for making a traditional remedy for a stomach complaint. Meguerba, meanwhile, had fled back to Algeria, having been picked up and questioned, then released, by the anti-terror police in the UK. He was arrested by the Algerian secret policy and was almost certainly tortured. To placate them he fabricated information and gave his interrogators the names and addresses of everyone he had ever met in London. The Algerian authorities passed on information about the three accused – David Khalef, Mouloud Sihali and Mustapha Taleb. Meguerba, described in the book as ‘the ghost at the feast’ in the trial, later retracted much of his initial confession. As for the ricin trial, government scientists found no traces of toxins of any kind but this information was not passed on to government ministers or to the police for more than two months. It was two years before the public was told. What could be the reason? Gareth Pierce, the lawyer who represented two of the accused, questions how it was that everyone was allowed to believe there had been a “substantial plot” rather than the “individualist, tiny, failed attempt” that it was. At every stage the “ricin plot” had been hijacked for political purposes. why did Blair fail to correct his misrepresentations about the existence of ricin in the run up to the Iraq War? how come Colin Powell used the same misrepresentations before the UN? how did the false stories about gas and poison conspiracies come to be printed in the media? to what extent was the source information examined with a view to excluding evidence gained through torture? why was the jury`s verdict subverted by returning the acquitted men to detention after the trial? After being acquitted three of the defendants were detained by immigration officers, and when the jurors heard the government was planning to deport them to Algeria, to face arrest and torture, they wrote to the Guardian newspaper to protest. Soon after the 7 July terrorist attacks on London, two of the five ricin trial victims were rounded up. They offered no resistance but both were brutally assaulted by police. They were not charged with any offence, but accused of being a threat to national security. It took 4 months for lawyers to negotiate their release and they are still fighting deportation. ‘Rarely has a legal case been so shamelessly co-opted by ministers, the media and the security forces to reinforce their own agendas,’ the authors write. Four of the defendants were swept up into what became a state conspiracy to mislead the public and to bolster the case for war and for tougher anti-terror measures at home. The fifth, Kamel Bourgass, was a disturbed individualist who is now serving a life sentence for the murder of DC Stephen Oake, who he killed in a panic during a botched police raid on a flat in Manchester in 2004. The book shows how the forces of the state – government, politicians, the security services and the press – worked together first to mislead the public at home and then to mislead the UN and the world. It was one of the many scandalous events of Blair and New Labour’s war on terror. Ricin! The Inside Story of the Terror Plot That Never Was, Lawrence Archer and Fiona Bawdon, Pluto Press, £13.